(October 23, 1903): The cornerstone of the Williams County Public Library’s Carnegie building in Bryan was laid. 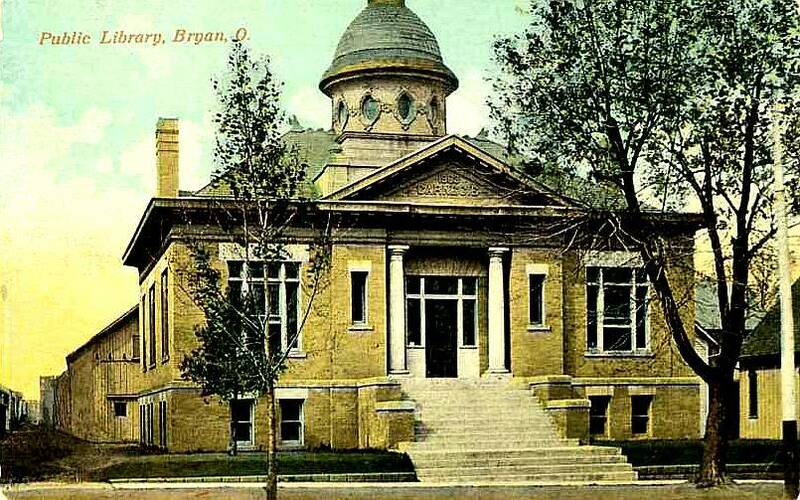 The Bryan Library Association was formed in 1882, but had no permanent home until construction of the Carnegie building near the northwest corner of High and Walnut streets. The community provided the site and philanthropist Andrew Carnegie donated $10,000 for the facility’s construction. The structure was designed by Paul O. Moratz of Bloomington, Ill., and was constructed by James Wineland of Bryan. The Carnegie library building was dedicated on December 20, 1904. This circa 1910 colorized postcard of the Carnegie building is from the Kevin Maynard collection–Courtesy of the Williams County, Ohio, Local History Exchange. Be the first to comment on "(1903) – Cornerstone Of The Williams County Public Library’s Carnegie Building Laid (Bryan, Ohio)"